Tixati is an easy-to-use file sharing program utilizing the distributed, peer-to-peer BitTorrent protocol. The program includes a clean, simple interface with the notable ability to prioritize files within a downloading torrent so you can get the first song or video downloaded and previewed quickly. Also supports customized download folders by file type, bandwidth throttling, transfer visualizations, encryption, prioritization, RSS support, IP filtering, DHT and magnet links. How to extract: Download the "Portable Edition" ZIP package and extract to a folder of your choice. Delete tixati_Linux32bit and tixati_Linux64bit. Launch tixati_Windows32bit.exe or tixati_Windows64bit.exe (for 64-bit OS). "Total size of application files when fully unarchived/uncompressed". We don't really want to open a whole 'nother can of worms about what exactly ought to be the appropriate scope of the "uncompressed size" field definition, with implication for every current entry in the Data Base, do we ? Tixati is not "72MB (uncompressed)"- it is either 38 MB (x32) or 36 MB (x64). I think it was not a wise idea that Tixati developers packaged the portable versions for Linux and Windows in one and the same archive- more traffic for them and for the users- I suppose a small number of users need both Windows and Linux versions. What surprises me is that the x32 build (tixati_Windows32bit.exe) is bigger- 38,037 KB than the x64 build (tixati_Windows64bit.exe)- 35,626 KB. Sleuths of the World, Unite ! No contest in terms of comparative memory usage. Was merely referring to Tixati's formerly stated "131MB (uncompressed)" binary file size. In my book, such a size is anything but lightweight. the SUM TOTAL of the multiple PE executables supplied for various platforms ! In terms of resource usage on my System Tixati is relatively light, at least compared to qBittorrent- as I am writing this Tixati (x64) uses about 50 MB of RAM, while qBittorrent- about 165 MB of RAM. So at least on my system Tixati is more than 3 times lighter than qBittorrent. just took the liberty to rub out the deceptive quantifier from the main entry. Is it better than µtorrent ? FYI: Tixati (the official portable package) is not completely stealth, it registers Magnet-Links, Torrents and "dsc" in the registry. "The program includes a clean, simple interface ..."
Tryed this software, but it locked several times. 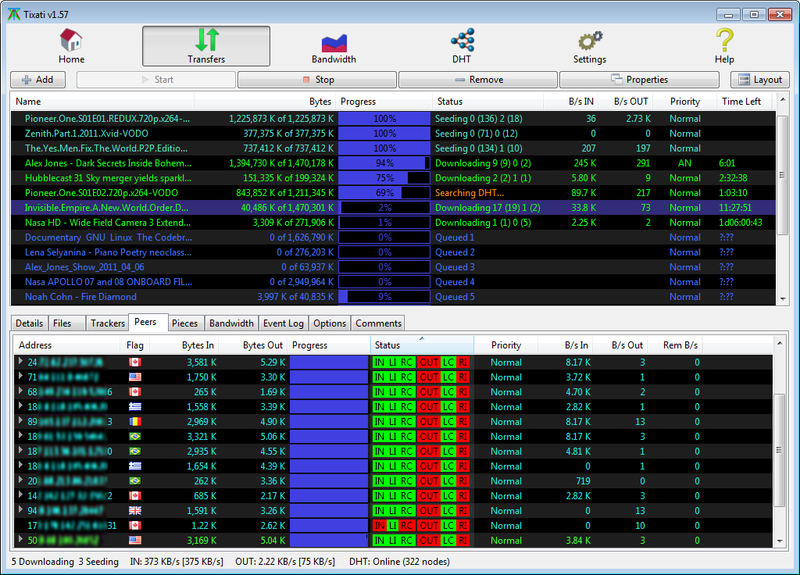 I really wanna like this software cause it reminds me of ol WinMX interface. I dont know why the software needs to be so huge (19MB). Portability categories issue fixed in 2.12. Something to be noted with the portable version, if you use categories with your downloads to organize them, the paths for the categories folders are stored as absolute, not relative, meaning you'd have to manually change the path every time you move Tixati. Friends tell me please how to use the "Channels" that is, to quote one of the users' himself dc ++ hub ". as they take (download) files ?? P.S. I apologize for my language, i am from Armenia. Tixati version 2.11 has been released. The latest portable version of Tixati- 1.99, contains both x32 and x64 builds so there's no need to install the x64 version any more.